A broken appliance may not be an emergency, but it's definitely annoying. So how do you get your landlord to fix it? PHOENIX, AZ — A broken appliance may not be an emergency, but it's definitely annoying. So how do you get your landlord to fix it? Pamela Bridge with Community Legal Services says by law, renters have the right to demand it. It's called self-help for minor defects. She says to first let the landlord know there is a problem in writing. If an issue violates the lease but does not affect health and safety, a landlord has 10 days to fix the problem. "The law is very clear in what you need to do in those situations," she says. In the 10 day notice you'll need to include whether you plan to terminate the lease and move or hire a licensed contractor if the problem is not remedied during the time frame. If you decided to fix it yourself you can pay for up to $300 or half your rent, whichever is higher. 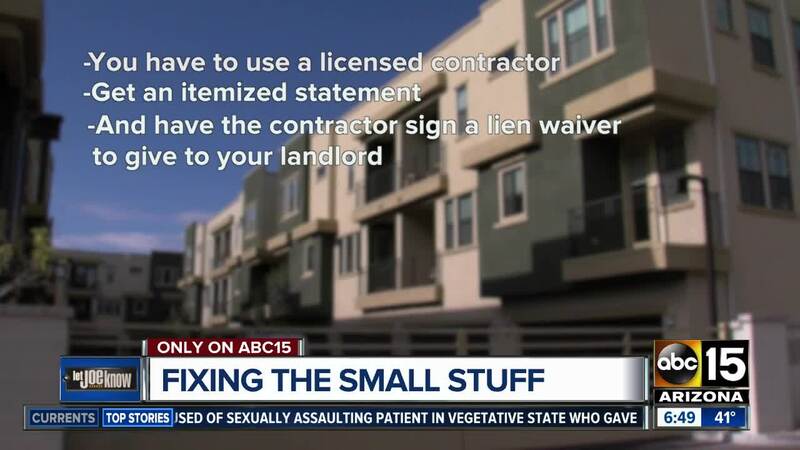 But to deduct it from your rent you must use a licensed contractor, send the landlord and itemized statement and have the contractor waiver of lien to give your landlord. "It's not used that often I think because tenants don't know about it," Bridge says. Here are sample templates of a 10-day notice, waiver of the lien and other forms tenants can use from the Southwest Fair Housing Council .